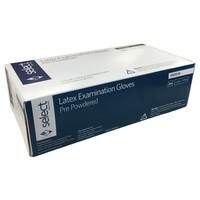 Select Latex Examination Powdered Gloves are very strong and durable gloves that provide excellent comfort and fit, and have been lightly powdered for easy donning and removal. Designed with a smooth texture and made extra-thin to increase sensitivity and feel, latex gloves are recommended as the first choice for barrier protection and will protect your hands from contaminants, dirt and potential irritants including most caustics and detergents. Select Latex Examination Gloves also have a rolled cuff to further add to their strength and durability, and are somewhat resistant to punctures, although they can still be pierced by very sharp objects.